No matter what you call 'em, I'm so thankful they're mine. 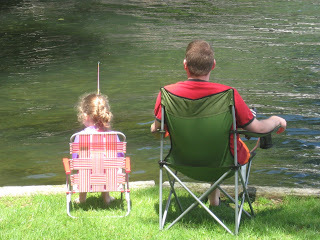 But seeing her sit next to her Daddy fishing on Findley Lake couldn't have been cuter. What was that? 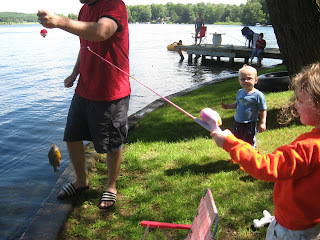 Did she catch anything, you asked? 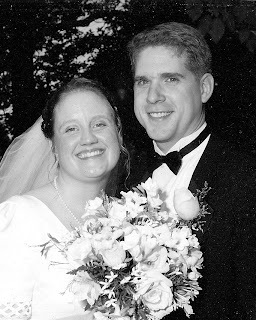 Nine years ago today on June 17, 2000, at 9:30 in the morning (yes, 9:30 in the morning) Duncan and I met at the church where I grew up and were married. It was a hot, sticky morning complete with a lot of sunshine. The inevitable June afternoon thunderstorm held off until we were all safely in the reception hall, fortunately. It was a beautiful day. A beautiful wedding. And more importantly, it's been a beautiful marriage. A beautiful life together. Shortly after I met Duncan on June 8, 1995, I knew that if he wasn't the man I married, that he'd be just like him. I pined away for him (truth be told) until the Fall of 1997 when we started dating. I struggled through nearly two years of dating a very indecisive man. He broke up with me in mid-June 1999 and proposed just 13 days later. Absence does make the heart grow fonder. We're living proof! We were married just under a year after that proposal and the rest is a wonderful history. It's been a wild and crazy ride and I'm thankful for (nearly) every minute of it. And for your viewing pleasure, I've scanned my very favorite picture of my Favorite and I from that marvelous day. I love our wedding photos but this is the only one that's ever been on prominent display. It's also the one that went into the newspaper. I just love it. It shows how truly happy we are! But I love that man in it exponentially more! Happy 9th Anniversary, My Favorite! Here's to 99 more! Whoever said that wasn't dealing with the five and under set! However, is including the kids in the housework really worth it? Absolutely! 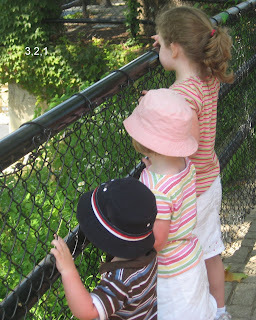 This particular post involves including the kids in kitchen work. And I don't mean those special kid-centered cooking projects, although there's nothing wrong with those. We do plenty of those as well. But I'm talking about including kids in daily food preparation. While there are things that aren't safe for my kids yet (using sharp knives, handling raw meat, using the oven, etc.) there are PLENTY of things they CAN do! Once Linus caught the cooking bug, we've been off and running! 1. Don't include kids if you care how a particular dish looks, if you're in a big hurry, or if you don't have time for clean-up after the food is prepared. It will not look like how you would do it, it will take more time than if you did it yourself, and there will be a huge mess to clean up! 2. Lower your expectations of the amount that "stays in the bowl." There will be spillage! I continually, albeit gently, remind everyone to stir gently. However, spillage happens! If the counter was clean to begin with, just scoop it up and put it back in! 3. If you have more than one child, use a combination of "taking turns"(pouring in ingredients, using the rolling pin) and "all hands" (stirring, kneading). Everyone is excited to help and patience will NOT abound! 4. Begin a collection of smaller kitchen tools. We've acquired mini whisks, a mini rolling pin, and even some small baking pans. These double as toys for the play kitchen and are used with play-doh. But as long as they're clean, they can be used in actual cooking as well. Here is the evidence of our kitchen adventures. And the ultimate cooking experience: making bread with Daddy! Linus LOVES to play with the flour! Remember what I said about the mess? Let me finish by saying that I am by no means perfect in this area. We've had some excellent cooking experiences. However I've failed and lost my patience while cooking with kiddos more than I'd like to admit. We just keep plugging along and they keep getting better and better. I know that one day they'll all be genuinely helpful while cooking. It is oh-so true. And it is why we try, even though not always successfully, to incorporate our children in as many aspects of our daily lives as possible. That being said, I'd better stop putting off the kids and go and be with them already! So, I know my day three riddle is lame. What I was trying to get at was that we went to the beach at the boardwalk on the third day! They have some jungle gyms in the shape of castles and pirate ships and the kids were dying to play on them each time we went to the boardwalk. They were always really crowded, so Duncan's idea was to bring all of our digging stuff to the boardwalk early in the morning (these photos were taken starting at 9:27am) and hang out on the beach by one of the climbing thingies. It was great fun! Violet tried her hand at sliding WITH her bucket. It turned out quite well! Amelie enjoyed the overall experience! Duncan was a little tall for the castle, but he managed to police Linus on the ladder just fine. We has such a great time on this little mini vacation. Our trip home, on rainy day four, took twice as long as it should have, thanks to the traffic from Cruisin' Ocean City. The kids couldn't have cared less! When we pulled into the driveway, the girls climbed into the front seats, Violet driving and Amelie riding shotgun, and pretended that they were returning to Ocean City. We're thankful that have had this opportunity and look forward to our next trip to the beach.